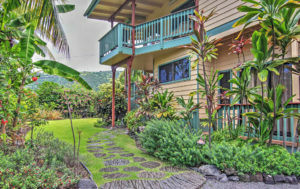 Dolphin Bay House is located in a quiet, friendly Hawaiian village that has retained the charm and quiet, easy pace of Old Hawaii. Your family will have plenty of space in our 2,000 square foot, 3 bedroom/3 bath Hawaiian vacation home with a large yard landscaped in tropical plants, flowers and trees. An easy 300-feet walk to the gorgeous Kealakekua Bay begins a relaxing, fun-filled day swimming in the crystal clear waters. Your family can enjoy some of the world’s best snorkeling, swimming and kayaking. A marine sanctuary, Kealakekua Bay is home to pods of Hawaiian spinner dolphins, turtles and other amazing marine life. Marvel at the dolphins and whales (in season). Admire the graceful green sea turtles and go nose to nose with a rainbow of exotic fish. Our vacation home is beautifully furnished in tropical style and is appointed with everything you need for your vacation on the Big Island. Dolphin Bay House accommodates 2 - 7 guests, and you will have use of the entire home while a guest with us. Book the adjoining cottage and add 2 more guests to your party. The living room, kitchen, dining room and two bedrooms are located on the second floor. The private and quiet third bedroom, on the ground floor, has it's own bathroom and sitting area with twin bed. This bedroom is only accessed through separate entrances off the breezeway and the front yard. There is not an indoor stairway to the upper level. Each bedroom has an attached bath with beautifully tiled, walk-in showers. There is a deep, soaking tub in the master bath. Granite countertops with two sinks in each of the upstairs baths add to the beauty and convenience. Our fully-equipped kitchen has granite countertops, top-of-the-line appliances, two sinks, filtered drinking water, coffeemaker and grinder, blender and all cooking and serving utensils you’ll need to prepare meals for the family. Catch the tropical breeze in true relaxed Hawaiian manner in the living room, dining room or lanai. Relax and watch as another spectacular Hawaiian sunset plays out before your eyes . . . truly a place to unwind and enjoy life! The lush landscaped gardens hold surprises around every corner. Orchids, ferns and many varieties of palms grace the area. From the outdoor shower you can enjoy the view of the potted herb garden, bamboo and ti, which is used in many Hawaiian ceremonies. You may find ripe pineapples in summer, grapefruits and tangelos in winter. Bananas and coconuts may be ripe at any time. No matter what time of year you visit Hawaii, our vacation rental in Kona will be the perfect place to relax and enjoy all there is to see and do. Many guests say "the photos don't do it justice!" Read the article about our efforts to make our home more eco-friendly in a featured article from "At Home Magazine." Eco-Minded Homeowner Achieves Designer Remodel on '80s Era Beach House. 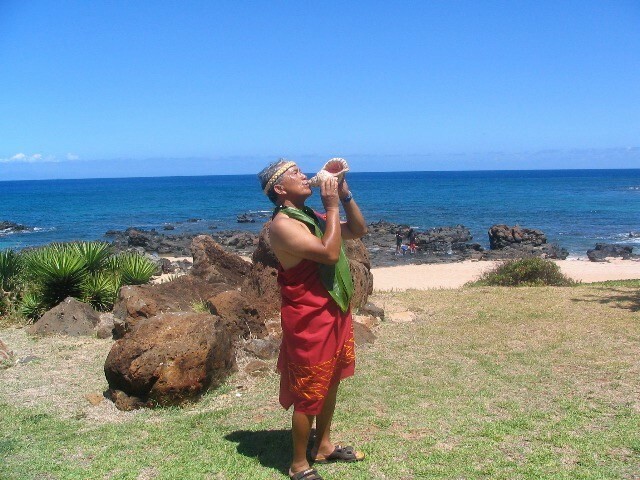 View our listings on other sites: Home Escape and Hawaiian Islands Vacation Rentals. • Refundable Security Deposit $500. • No refunds within 60 days of arrival, however, please contact us to inquire about changing your dates. • You may book your stay directly with us (no traveler fees). • Dolphin Bay House sleeps a maximum of 7 guests in beds. • We can provide a Pack 'n Play crib for infants. • Identification of person who booked may be requested. • Check in time is 4:00 pm.